WASHINGTON — Unlike virtually every other candidate in the 2020 Democratic field, former Colorado Gov. John Hickenlooper is not a fan of the Green New Deal, and he wants you to know it. 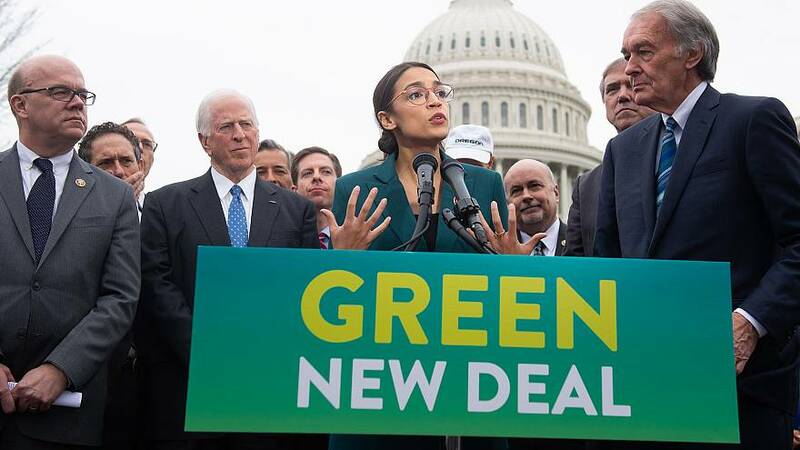 Rep. Alexandria Ocasio-Cortez, D-N.Y, is the biggest star in the Democratic Party at the moment and her Green New Deal, which calls for massive government investment and regulations to fight climate change, is her signature issue. It's popular. A whopping 91 percent of likely Iowa Democratic caucusgoers say they favor candidates who support it, according to a Des Moines Register poll. And all six Senate Democrats running for president co-sponsored Ocasio-Cortez's bill. Former Rep. Beto O'Rourke said, "I haven't seen anything better" to fight climate change. But much of that support may be soft since, much like Medicare for All, many presidential candidates qualify their support by saying they're open to lots of potential ways to fight climate change. Enter Hickenlooper, who made his opposition to the plan plain in aWashington Post op-ed titled, "The Green New Deal sets us up for failure." His campaign then made sure reporters saw the op-ed and made him available for interviews. "I wasn't out there trying to rip anything apart," Hickenlooper told NBC News in a phone interview. "I agree completely with the sense of urgency — we're within a decade or so of suffering irreversible damage of the planet." He likes the idea of _a_ Green New Deal, just not this one. He pointed to its inclusion of issues like a federal jobs guarantee. His op-ed cited a fact sheet put out by Ocasio-Cortez's office that doesn't reflect the content of her bill and which she later disowned, and criticized the plan for not acknowledging the role of the private sector nor the economic dislocation that would result from abruptly killing the fossil fuel sector. 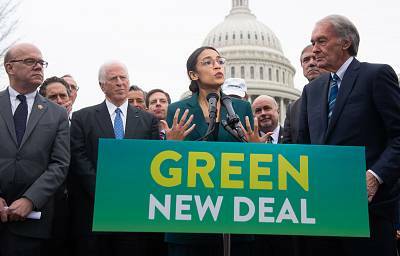 "Campaigns are about different voices and different positions, and I felt there was a benefit in beginning the discussion around what would a more focused Green New Deal would look like," he said. Politically, the move helps Hickenlooper carve the ideological space he hopes to occupy in the crowded primary, which his advisers see as open to big ideas, but pragmatic. It's a position that has sometimes seemed muddled, like when Hickenlooper struggled to answer whether he's a capitalist. The only other candidate tovocally oppose the Green New Deal is former Rep. John Delaney. For Hickenlooper, who once worked as a geologist in the oil and gas industry and more recently drank fracking fluid to show it was not toxic, a better solution involves bringing industry and environmentalists together and encouraging them to collaborate. It's a faith in compromise — critics would say a blind one — informed by his experience in Colorado, where he facilitated a process that led to fracking regulations embraced by both extractors and environmental activists. Of course, scaling that up to a national level and to many more industries would be another matter entirely. And much of the environmental movement have now moved beyond mere regulations and want to keep carbon in the ground and prevent it from being extracted at all. But Hickenlooper believes there is always a way to get to a compromise. "Trust me, people told me when I said I wanted to get industry and the environmentalists to sit down together... 'You are ignorant and naive and that will never happen,'" he recalled. "But in the end it's worked. It takes time, but it's not impossible." He will put that belief to the test next week, when he makes a campaign swing through the South in some of the most conservative states in the country: Alabama, Georgia, Texas, South Carolina.